This is what I'm wearing on my nails today. 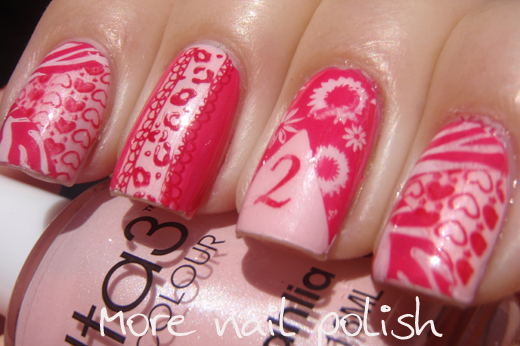 A crazy hot pink and pale pink multiple stamped mani. Today is my daughters 2nd birthday and I just had to create something as bright and bubbly as she is. This is so pink, it's right of of my comfort zone, but I have to say it really did match her perfectly today. I started with a base of Ulta3 pale dahlia and then stamped the hearts onto my pinky and index finger (which I managed to smear with topcoat). I then did the number 2. After the top coat on those had dried, I taped off all my nails in different areas and painted over them with Ulta3 pink hibiscus. I left that to dry with the tape on and then stamped the zebra stripes and the flowers. The last bit I stamped was the center of the middle finger after the tape was removed. Shortly after applying top coat I managed to bump and scratch my ring finger and messed up the flowers. Note to self: do your right hand first before doing your left hand. Then you will have less chances to screw up the hand you photograph while painting your other hand! Here is my 'baby' girl. I know every parent says it, but I just can't believe how quickly they grow up. And in case you were wondering, yes her nails are painted pink too (she loves mummy painting her nail, but not nearly as much as she likes painting them herself!) and that is hand cream on her finger - it's never to early to start with hand and nail care ;) Oh, and that picture in the middle is her sending you a big kiss! omg how cute! Happy birthday! Aw that's so cute :-) Happy birthday! Those nails are really cute but not half a cute as that angelic looking little girl of yours. 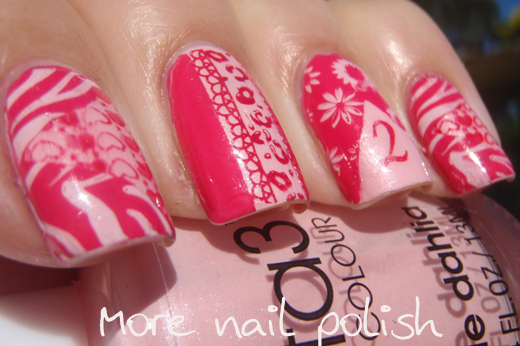 love your nails!! aww cute happy birthday! So cute! Your daughter and your nails! How cute! 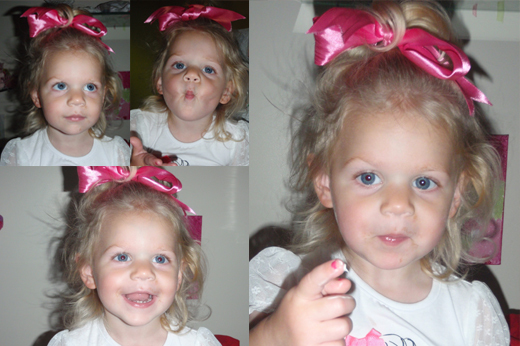 Happy 2nd Birthday to your gorgeous little girl!! Love the nails. 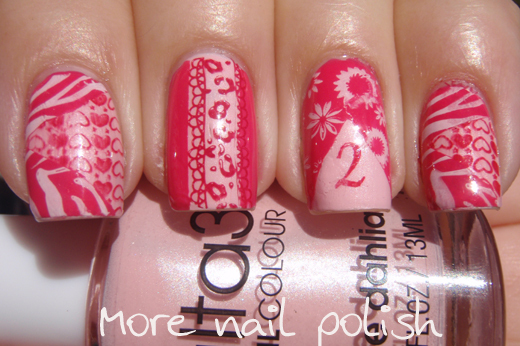 Great idea using multiple stamps and tape! I've never seen that done before. I love your mani. Happy Birthday to Miss Skyla!